It's time to kick off the B1G TEN football season with the 7th annual Tucson B1G TEN Conference Mixer and Fundraiser for the Big Brothers Big Sisters. The B1G TEN clubs here in Tucson will be getting together in anticipation of what should be another exciting year on the gridiron! The exciting news is that this years event will be at the University of Arizona's Sands Club overlooking the Football Stadium. Wow! Awsome! As in the past, this event is for alums, fans and guests from all the B1G Ten Universities. The Tucson Illini Club has participated in this fun filled event every year, and we will be there again this year. So, let's have a big Tucson Illini showing and be sure to wear your bright orange to let the other schools know WE ARE THERE! There will be a lot of prizes raffled off. Your Tucson Illini Club is again providing a GRAND PRIZE of Holiday Bowl tickets for the game in San Diego! This Bowl game will be a B1G Ten/ Pac12 matchup. In addition to the raffle, this year there will also be a silent auction - all for a great cause. Oh, yes...parking. No Problem. The University will provide free parking in the garage right next to the football stadium where the event will be held (third floor - north end). This is a great opportunity to show our school colors and do our part to help the Big Brothers Big Sisters. 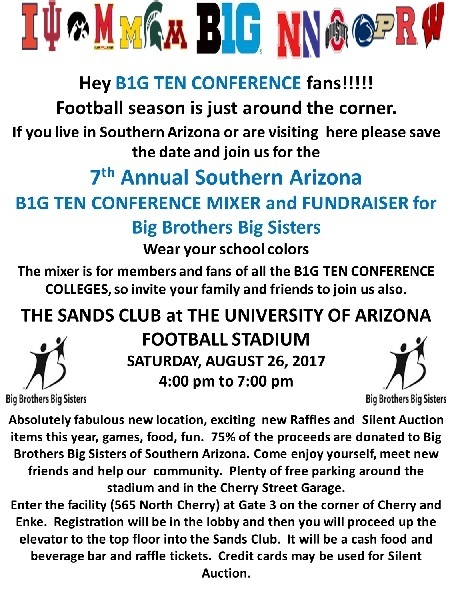 If you would like to make an online donation to the Big Brothers Big Sisters, click on this link: https://www.firstgiving.com/tucsonbigs/the-b1g-ten-conference-mixer-2017. This is a pre-mixer competition between the schools to see whose alums will donate the most $$$$.